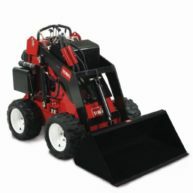 The Toro wheeled W320-D diesel compact utility loaders are built to deliver a high power-to-weight ratio in the compact utility loader category. At only 104 cm wide and zero-turn capability, these compact utility loaders can access confined spaces and their short length contributes to efficient trailering. The removable counterweight allows for added lift capacity or increased down pressure for optimal attachment performance. With 4 Paw independent 4-wheel drive traction system, it’s sure on its feet in any environment, wet or dry. The Toro wheeled compact utility loaders are without doubt built for Australia’s tough conditions. fuel line near the base of the tank. ith 435 CCA minimum at –18 degrees C (0 degrees F) and, 70 minutes reserve capacity per SAE J537L. orward direction, and push the lever forward (detented) to operate the attachment in the reverse direction. When non-electric, hydraulic operated 4 in 1 bucket option fitted, detent components maybe removed.